Floristic studies were conducted in Baraytha forest. A total of 82 species belonging to 72 genera and 33 families of angiosperm were recorded during the sampling of vegetation. Based on species contribution Fabaceae, Asteraceae, Rubiaceae, Combretaceae, Malvaceae, Mimosaceae and Euphorbiaceae were found as dominant families. 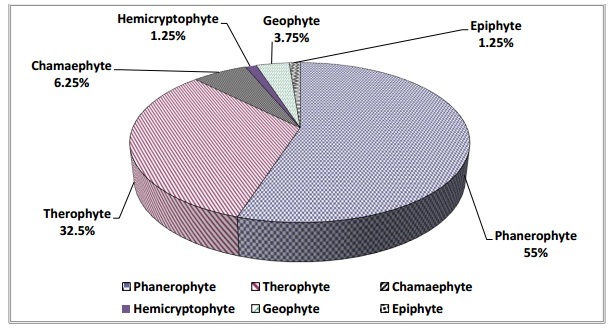 Life-forms in order of importance were Phanerophytes (55%), Therophytes (32.5%), Chamaephytes (6.25%), Geophytes (3.75%), Hemicryptophytes and Epiphytes both (1.25%). The dominance of phanerophytes and therophytes reveals that phytoclimate of the area as phanero-therophytic. Fig. : Floristic composition, life-forms and biological spectrum of tropical dry deciduous forest in Sagar District, Madhya Pradesh, India.